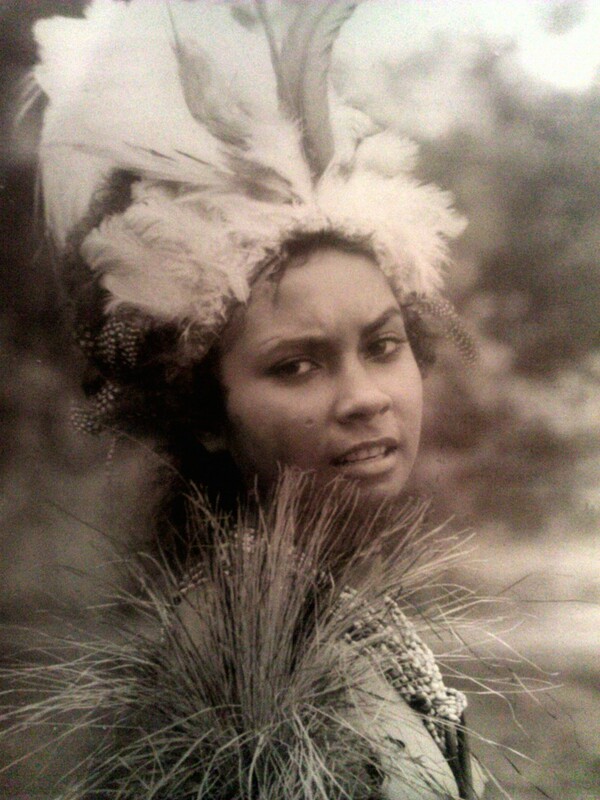 At the age of 15, in high school, I wore the same headdress my grandmother and I made. To date, I have this precious item with me. It has changed, lost some feathers but it still works as a centrepiece every time I wear it on my forehead. Mother returned from the Lae city markets. It was a Saturday afternoon. Today, we were preparing for a big singsing in our village. We were preparing our best for the Annual Morobe Show. There would be hundreds of tribal groups and performers so, we had to wear only authentic costumes. We had to wear the costumes carrying markings and stories of our people and the costumes we inherited from our ancestors. I needed a centrepiece for my headdress. As she came up to me, I searched Mother’s face for emotion. She teased my un-spoken questions with the twinkle and mystery she showed in her eyes. Finally, she was smiling. Her lips remained sealed more so because she was chewing but I knew she got it. I broke a smile at her and completed my task. “There was only one Highlander selling two tiyeng ngawahu (Bird of Paradise plumes) and I bought one”, she said. “Ohhh ngayam!” grandma responded in Bukawac, meaning “good”. Grandma was pleased the mission was accomplished. I sat next to Grandma, helping her to twist the sisal fibres on my thigh into strings. We twisted two separate bunches of single fibres which formed a string. Then, we dyed the strings yellow and orange with turmeric roots, and red from Mbuec, a tree that gave red dye in its seed pods. To get grey, we buried the other strings in the muddy banks for a few weeks. For the black we used crushed charcoal with coconut oil. Once dried, Grandma used a ‘needle’ made from a 15cm long re-cycled and sharpened wire. This ‘needle’ came from the inside of a broken umbrella bone. Grandma sewed the strings into bilums (string-bags). The new bilums will be worn in the dance on the day. We used some of the strings to thread scented leaves and herbs for breast decoration. These same leaves were used for magic, but I was not allowed to know. Not yet, Grandma said. As she tried to speak, Mother’s mouth was full of red chewed betel nut and she needed to spit. She eased her bilum of food down in a heavy thud. She fished in her smaller shoulder bilum and spat. She held out her hand with a crumpled newspaper wrap. I jumped up to grab it. I was thrilled. Without searching her bag as I usually do for the market gifts of peanuts, green margarines and cucumbers, I turned away from Mother. I smiled at the faded newspaper as I bent and laid the small light bundle on the dry sand next to my twisted strings. I sat down and brought Mother’s parcel to my lap and un-wrapped it. I was afraid to touch her at first. The bird was beautiful and so soft. A spot of black around her beak. Green velvet on her neck and breast. The rest of her body was a burnt butter yellow with a white centre and a beautiful pale yellow outer-feathers. The base of the main feathers was an intense, vibrant golden-yellow which faded out into white. Her inside was gone. It was shallow. She had been dried, smoked and flattened. I suddenly felt a pang of guilt and pain swept over me. I thought of the bird flying high and calling out in the trees and I wondered if she suffered. I felt more guilty about this bird than the chickens which I already had feathers from. I was seven and never held a real Bird of Paradise in my hand, even a dead one. I had seen many on headdresses during the festivals. I have held other birds and had parrots as pets. I looked at the bird a little more, each faint wiry piece that joined the next. Then I reached out and touched her. Of the 39 species of the Birds of Paradise in the island of New Guinea (PNG and West Papua), this one, known as “Greater Bird of Paradise” was the most precious centrepiece for our tribal headdress. The birds did not live in our bush. Our people traded and bought the feathers from the highlanders. Mother had to seek out hunters from Western and Southern Highlands who rarely brought the feathers to the main market in Lae. She was very lucky today. To have a Bird of Paradise as your centrepiece was the ultimate dream of every dancer in our tribe. Many other Papua New Guinean tribes wore numerous plumes in singsings. Many more longed for such honour but only settled for parrot, cassowary, and chicken feathers. This bird was our National emblem. In our Wagang village singsing group, most people wore cockatoo, parrot, cassowary, turkey, guinea fowl and chicken feathers – all made into spectacular head pieces. I laid out the Bird of Paradise plume and stitched it into my headdress. The headdress was made of feathers and shells, sewn onto a tapa cloth. Most of the headdress was completed days before. I was only waiting for the centrepiece. The cloth would be tied around my head. The Bird of Paradise would be the centre feature. When I wore the headdress, the golden-yellow, wispy and silky soft feathers would sit high above and dance. The beak would be looking down at me and her tail would move with me as I danced the we-e si-ing (war dance). What an interesting story! Love it!